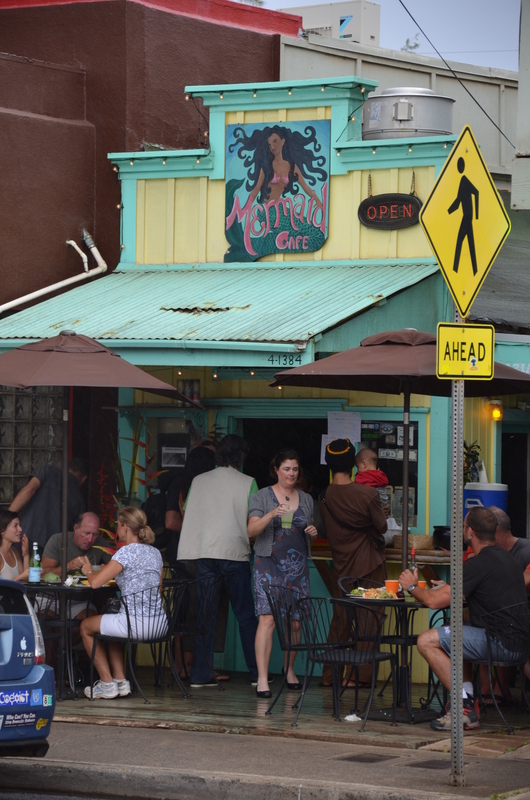 These are the best places we have found to eat on Kauai. Three of the four are extremely affordable — you can easily eat for less than $15 each. In Hawaii, that’s no small thing. Enjoy! 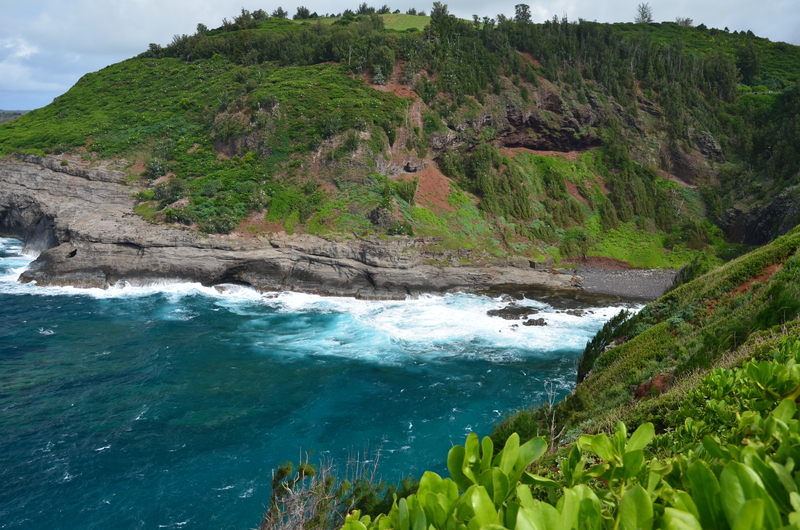 Love the color of the ocean seen from Kilauea Lighthouse! Buy some fish to grill for dinner while you enjoy lunch. Best ahi wrap we’ve found. The reviews are great, too. Very difficult to find this little place; its entrance is in the back of the building, facing away from the road. Keep looking; this will be worth your time. Have lunch there on the way to or from the Kilauea Lighthouse. The Lighthouse is described as picture postcard perfect (and that’s about all it is, in my opinion). Take that picture, and then have fun looking at the coastline laid out below you. The inlet that it overlooks is gorgeous, and the many albatross nesting on the cliffs and riding the wind currents are more than worth the trip. This hole in the wall delight is in Kapaa. Don’t let the outer trappings dissuade you, however. This has clearly outgrown this old kitchen; check out the menu on the website! You’ll find that this little restaurant serves some of the best fresh food around. The Ahi Nori wrap is a delight and recommended. Seating is limited; there are counters running down the alley towards the ocean with stools when they’re available. Call it rustic. Call it charming. And enjoy the food! TCs is the best part of the Coconut MarketPlace. 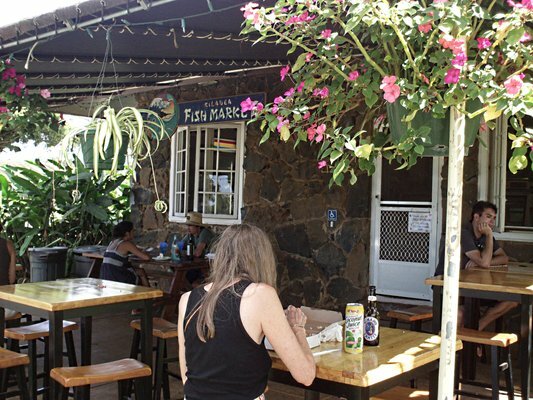 Wander around the shops of Kapaa while you’re there. We wandered into the MarketPlace on our first visit to Kauai, and we’ve returned on every visit. The location is between Lihue and Princeville, so you’ll find it’s convenient no matter where you are and where you are going when you’re on the east shore. 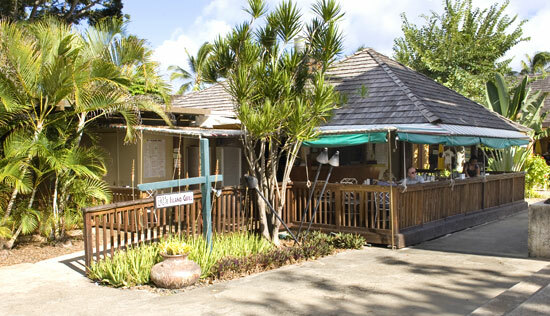 The shopping center has a very typical range of shops for Hawaii, from t-shirts to luggage, from jewelry to souvenirs. After you’ve done a quick lap to see the sights, then settle in for a very informal lunch or dinner at TCs. Whether you have fish and chips or a catch of the day grilled platter, you’ll enjoy this shack that would be a diner if it was located on the mainland. Here, it’s an Island Grill! This is the best luau we have found. It’s currently showing on Tuesdays and Fridays, so plan accordingly. Arrive early to tour the grounds and see the wares offered by the craftsmen. 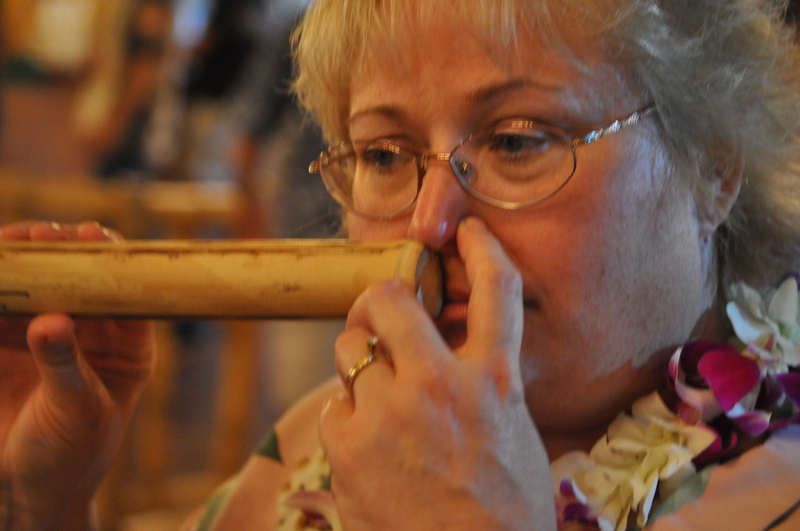 Velda needed this nose flute, though her playing hasn’t advanced much since she stopped drinking the rum punch. The cost is currently $65 for the all-you-can-eat buffet and show. In my opinion, you don’t go to a luau for the food, you go for the show. For the ohana. You’ll eat, of course, and the food here is fine for a buffet. Try the poi (it’s required) and expect a macaroni salad. But this show was worth the price of admission. I’ve read reviews that prefer other luaus, which is always understandable. Opinions will vary. Comfortable seating in and around the performance area. The principal stage is in the middle; the main performance is in the round. A few ancillary stages bring the action even closer to the audience. The show tells a story (loosely!) and takes the audience on a journey. It’s more than just a variety show, as some luaus tend to be. This gets big points in my book. Nice performances from dancing to fire juggling. Very visual, very colorful, very theatrical. For me, that’s a win, win, win. We had our 30th Anniversary dinner at Gaylord’s at Kilohana, which is also located on the Kilohana Plantation. Nice event meal. Pricey, and nice. Our problem, unfortunately, was that we ate at the restaurant on our anniversary, and that was a Tuesday evening … when the luau was happening 100 yards away. We enjoyed the meal but the drums were a bit annoying. Wish we would have known to avoid the restaurant on luau nights! We’ve explored many other restaurants OF COURSE but none have risen to the level that I would recommend them. One of the nicest restaurants on the island is Roy’s on south shore, and we’ve yet to try it, honestly. We haven’t tried the one in LA, either. Or the one in Honolulu. Or the one in Las Vegas. Maybe someday. Luaus are about family. Ohana.